Spring is here and my pasty white skin has come out to greet the sun. I don't know about y'all but my legs have been in hibernation and they are in major need of some sunlight. 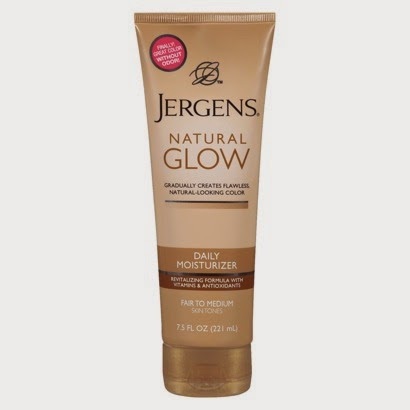 I haven't had the best luck with certain self tanners in the past and decided to give this Jergens Natural Glow a try. I love Jergens lotion and this did not disappoint. It looks like a regular white lotion going on and I really like the smell. I have used it for four days now and I am definitely seeing some color on my legs. I would make sure to wipe it off your hands really well because even though it is the color of lotion it will stain your hands. This is going to be my go-to product to get me ready for Puerto Rico in a few weeks! I would highly recommend trying it out!